AgEdNet.com lesson materials have all been matched with the National Council for Agriculture Education's "National Agriculture, Food and Natural Resources (AFNR) Career Cluster Content Standards" as revised in 2015. Standards are © 2015 National Council for Agricultural Education and these excerpts are used by permission. We are excited to provide this valuable information for all our subscribers. 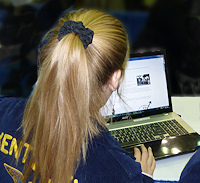 Each AgEdNet.com lesson lists matching AFNR standards. See individual lessons for details. Career Ready Practices (CRP) -- fundamental skills and practices that all students should acquire to be career ready such as: responsibility, productivity, healthy choices, maintaining personal finances, communication, decision-making, creativity and innovation, critical-thinking, problem solving, integrity, ethical eladership, management, career planning, technology use and cultural/global competency. View CRPs matched to AgEdNet.com lessons. Cluster Skills Standards (CS) -- fundamental knowledge and skills related to all AFNR professions. View CS standards matched to AgEdNet.com lessons. Agribusiness Systems (ABS) -- the study of agribusinesses and their management, including record keeping, budgets, business planning, and sales and marketing. View ABS standards matched to AgEdNet.com lessons. Animal Systems (AS) -- the study of animal systems, including life processes, health, nutrition, genetics, management and processing, through the study of small animals, aquaculture, exotic animals, livestock, dairy, horses and/or poultry. View AS standards matched to AgEdNet.com lessons. Biotechnology Systems (BS) -- the study of using data and scientific techniques to solve problems concerning living organisms with an emphasis on applications to agriculture, food and natural resource systems. View BS standards matched to AgEdNet.com lessons. Environmental Service Systems (ESS) -- the study of systems, instruments and technology used to monitor and minimize the impact of human activity on environmental systems. View ESS standards matched to AgEdNet.com lessons. Food Products and Processing Systems (FPP) -- the study of food safety and sanitation; nutrition, biology, microbiology, chemistry and human behavior in local and global food systems; food selection and processing for storage, distribution and consumption; and the historical and current development of the food industry. View FPP standards matched to AgEdNet.com lessons. Natural Resource Systems (NRS) -- the study of the management, protection, enhancement and improvement of soil, water, wildlife, forests and air as natural resources. View NRS standards matched to AgEdNet.com lessons. Plant Systems (PS) -- the study of plant life cycles, classifications, functions, structures, reproduction, media and nutrients, as well as growth and cultural practices, through the study of crops, turf grass, trees, shrubs and/or ornamental plants. View PS standards matched to AgEdNet.com lessons. Power, Structural and Technical Systems (PST) -- the study of agricultural equipment, power systems, alternative fuel sources and precision technology, as well as woodworking, metalworking, welding and project planning for agricultural structures. View PST standards matched to AgEdNet.com lessons.